Han Solo is back in the cockpit of the Millennium Falcon – and so is Chewbacca the Wookiee in the first official snap from the next Star Wars spin-off movie. 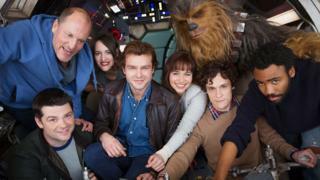 The picture shows Alden Ehrenreich – the young Han – flanked by castmates Woody Harrelson, Phoebe Waller-Bridge, Emilia Clarke and Donald Glover. Co-directors Phil Lord and Christopher Miller also appear, as does Finnish basketball player Joonas Suotamo. In case you’re wondering, the mighty Finn is the one in the Wookiee costume. Glover plays Lando Calrissian in the currently untitled film, which began principal photography on Monday at Pinewood Studios in Buckinghamshire. It’s not yet known who Waller-Bridge will be playing, though reports earlier this month suggested she was being considered for a “CGI-driven” character. Westworld star Thandie Newton will also have a role in the film, though she is not featured in the informal snapshot released on Tuesday. According to the official Star Wars site, the stand-alone film will explore Han and Chewie’s adventures before the events of Star Wars: Episode IV – A New Hope. Here’s what Lord and Miller had to say about the film, set for release in May 2018. “Watching such inspired people from all over the world, with such unique voices, come together for the sole purpose of making art, is nothing short of miraculous. Great shot, kid! Now let’s blow this thing and go home.